A day exploring how Suffolk builders and householders found ways to appease the fear of invasion by malign spirits in the home. Most of the evidence dates from the 16th century or later, but we shall see how some of the practices used have a much older history. 10.15 Using the archaeological record we will explore the methods used by Suffolk householders to protect themselves and their stock from evil spirits. 11.30 An examination of the benefits of protection using scribed marks in the vulnerable parts of buildings such as doors, windows, and the chimney. 14:00 A look at more symbols from furniture and household utensils, especially those associated with the Virgin Mary before the Reformation and after. 15:15 A consideration of the evidence for specialist protective magic in Suffolk houses and how it relates to continuing practices in other parts of the world. Timothy Easton is an artist and architectural historian who has lived in Suffolk since 1972. As a specialist in the use of historic colour he is a consultant for the Globe Theatre and the Getty Museum in London. 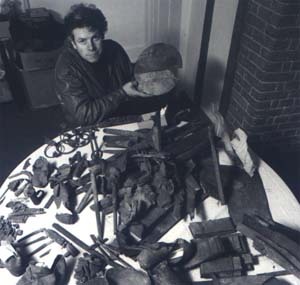 He has been recording and collecting archaeological material associated with protective magic for buildings for many years and has pioneered the study of the magical protection of buildings.